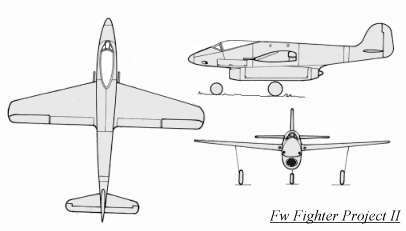 This was the second design from Kurt Tank of the Focke-Wulf company for a single-jet engine, single-seat fighter, submitted June 9, 1943. The wing was mounted mid-fuselage and had a slight sweep on the leading edge and straight trailing edges. A Jumo 004B turbojet was slung beneath the fuselage because of fears of operational problems associated with mounting the jet engine on top of the fuselage. The main advantage was to facilitate maintenance, but there were several bigger disadvantages to this design, such as the nose wheel blocking the intake on takeoff and landing, foreign matter being sucked into the intake since it was so close to the ground and the destruction of the jet engine in case of a belly landing. The cockpit was protected by armor of varying thicknesses. Armament was to be two MK 108 (70 rounds each) or MK 103 30mm cannon in the fuselage nose and two MG 151/20 20mm cannon (175 rounds each) in the wing roots.